• BILIKISS ADEBIYI, ANNA GROSS, ANGELA HOJNACKI, and KEVIN KUNG are all MIT students. Waste pickers know what they need to improve their work. MIT students want to get out of the lab. When waste pickers and students come together, they can develop tech­nologies that provide earning opportunities for people living in extreme poverty and make cities cleaner. In the summer of 2012, several waste picker groups and student groups did just that. Read about four such collaborations here. 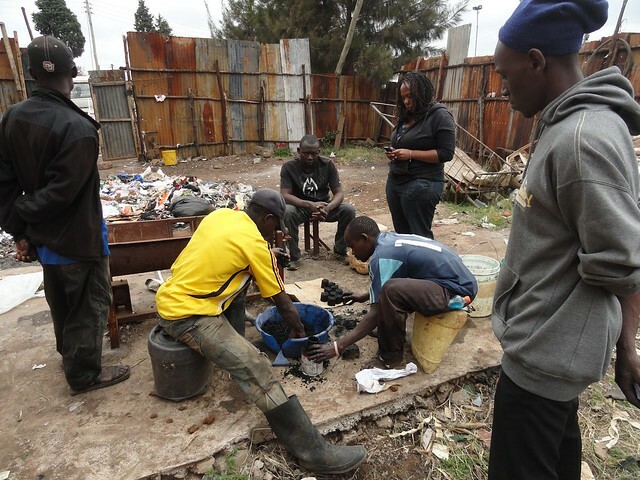 Making charcoal briquettes from organic waste in Kibera. Photo by Kevin Kung. In many urban slums, uncollected waste negatively impacts health and the environment, while the rising cost of charcoal can cause serious financial strains on slum residents. In Kib­era, which is outside of Nairobi, 60% of household waste is organic, which is either left to decompose or set on fire. Takachar, through a unique system of incentives, engages local waste-management cooperatives to mobilize slums to turn in their waste – and not just the few households that can afford waste pick-up services. Takachar then creates charcoal from organic waste, a valuable local fuel in great scarcity. During summer of 2012, Takachar worked with a local coop­erative to optimize aspects of charcoal production, including waste sourcing, carbonization, briquetting, and marketing. Ultimately, Takachar aims to impact: greenhouse gas emis­sions, by keeping organic waste out of informal dumpsites; livelihood income of residents, by providing jobs; and defor­estation, by offering an adequate fuel substitute to wood. Shalu Nanaware works with SMS. Photo by Anna Gross. In an effort to address the multitude of human health and environmental problems caused by refuse-littered streets and over-capacity landfills, Stree Mukti Sanghatana (SMS), a women’s organization based in Mumbai, India, has turned to anaerobic biodigestion as an urban waste management tool. The process, in which organic waste decomposes in the absence of oxygen, creates methane gas that is cap­tured and utilized as cooking fuel. Not only does this offer an alternative to firewood and propane, it prevents the release of methane, a potent greenhouse gas, into the atmosphere. As part of its Parisar Vikas program, established in 1998, SMS trains female waste pickers to operate small-scale bio­gas plants. Parisas Vikar simultaneously creates jobs, improves working conditions, and promotes zero waste strategies. Dr. Sharad Kale of the Bhabha Atomic Research Centre (BARC) has modified the conventional technology to include a predi­gestion step, in which aerobic thermophilic bacteria begin the decomposition process and ultimately help generate a higher quality methane and weed-free fertilizer. Institutions throughout the Greater Mumbai region have adopted his Nisargruna model. There are now more than 100 plants in operation, many of which are run by SMS. Walter Volpini and Denis Ferreira installing a waste vegetable oil filtration system at ARES Cooperative. Photo by Marta Marello. The Green Grease Filtration system is a simple device used to filter waste vegetable oil (WVO) collected from restaurants and households. Students from three universities – MIT, Uni­versity of São Paulo (USP), and the Aeronautical Institute of Technology (ITA) – collaborated to develop the device. The Green Grease filtration system uses simple and inex­pensive materials, such as plumbing parts and blue jeans, to remove 100% of the solid particles and more than 85% of the water from the oil, significantly increasing its value. 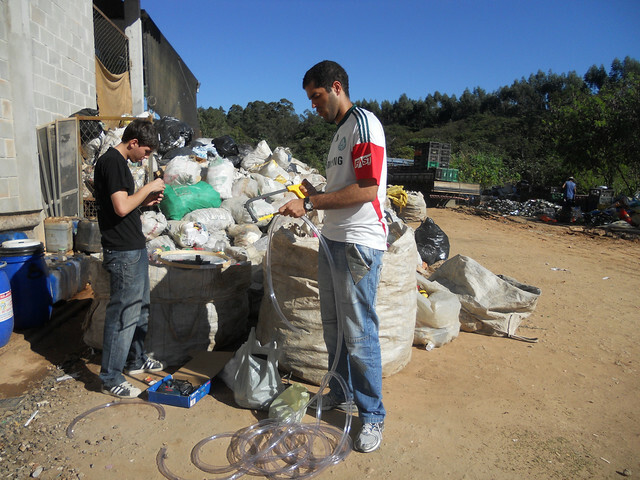 Rede CataSampa (the São Paulo union of waste pickers) piloted the system in May 2011. The Green Grease filtration system is now being implemented in seven São Paulo waste picking cooperatives. Wecycle is a pedal-powered collection vehicle. Wecyclers use the vehicle to collect source-separated recyclables di­rectly from households, and award points in exchange for materials collected. Households receive their points via SMS and redeem them for basic items, reducing their household expenses. Wecyclers carried out initial research in Lagos, Nigeria in January 2012, collecting 300 kilograms of recy­clable material from over 300 people. The team of students from the Sloan School of Management traveled to Lagos in August 2012 to launch a pilot that reached 800 households. Wecyclers simultaneously provide low-cost recycling collec­tion services and incentivize participation from households. This post is an article from Paper Radio Issue #2: Trash. Paper Radio is CoLab’s print publication.